Roll the Cubes. Begin with ‘Once upon a time’ and tell a story that links together all 9 face-up images and spark your imagination. throw them and invite people to weave some of the symbols into their story. throw them and invite people to weave some of the symbols into a Biblical story. 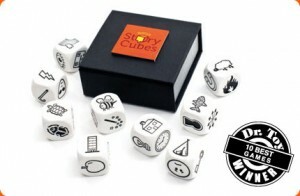 Play a what happened next, using the symbols to storytell an Acts 29, or a Mark 17 ie the chapters after the chapters that are written. You could make your own cube, for example an angel for the gospel of Matthew, lion for Mark, the ox for Luke, the eagle for John. Then throw the gospel cube plus the nine and invite people to think of, and then share, a story from the gospel that uses that symbol. Or your own cube that has an angel, a mountaintop, a forest. Use these to invite personal/group sharing – a mountain top moment ie when you were at your best, a dark forest moment ie when you were at your most scared, an angel moment ie when something happened you couldn’t explain. Why? It invites creativity and imagination and humanity around the weave of God in our lives and the Biblical story. I think I might just buy one for the upcoming National Biblical Storytelling gathering here in Adelaide (Sept 24-25). It would be a fun addition to my workshop, helping people tell their story and God’s story. Wow, thanks for the link Steve… I gotta get me some of them!! It looks so fun, and yet so hard!